We have a a long driveway down towards the house. 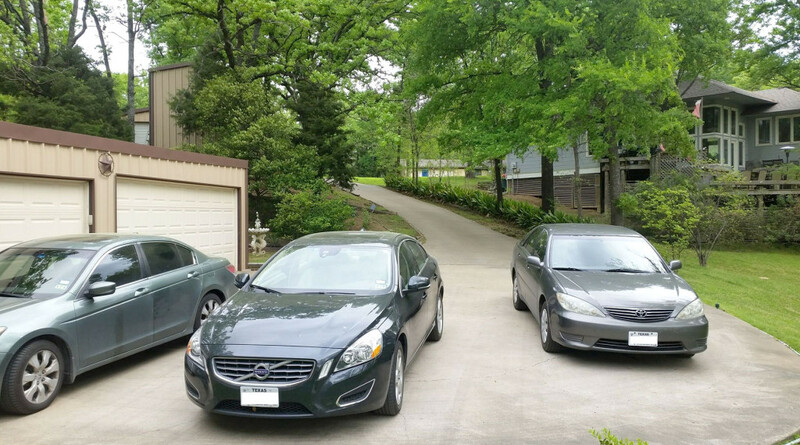 At the end of the driveway you can park four to six cars, al little bit depending on how large they are and how close you park. We have been able to park three cars across with three more behind. As you can see below, with three cars there is plenty of space left, especially if you optimize the parking and park close. You can also park two more cars or a vehicle with a boat trailer up at the street, in front of our RV garage. We ask that you limit the number of vehicles to this number (eight total, including trailers) as this is a residential neighborhood.